Moto GP-San Marino | B.I.R.D. Discussion in 'The Sports section' started by KUCIAR666, Sep 7, 2017. A somewhat incomplete Movistar Yamaha MotoGP Team returns to Italy for the Gran Premio Tribul Mastercard di San Marino e della Riviera di Rimini this week, with Maverick Viñales as the team's sole representative following Valentino Rossi's injury. A fortnight ago, Viñales ended the weekend at the Silverstone Circuit on a high, securing a hard-fought second place. Thanks to this podium result, he is now in third place in the championship standings, 13 points from first and with a 4-point margin to second place. This weekend the Spaniard aims to inch closer to the top spot in the rankings again, by securing a place on the San Marino rostrum. He visited it once before, when he scored a second place in the Moto3 class in 2013. Though the improved feeling on his YZR-M1 at the British Grand Prix - and the positive private Misano test results of the week before - left the young Spaniard in high spirits, he is saddened that he will be riding without his teammate at the upcoming MotoGP round. The Italian supporters are also disappointed that Rossi will not be racing at his home Grand Prix, especially as the track is just 20 minutes down the road from his home in Tavullia. Though the fans will deeply miss the nine-time World Champion's presence, they will be cheered up by the news that - after breaking his leg in an enduro training accident on Thursday, 31st August - his recovery is going well. The Italian has confirmed that he will be back on his bike as soon as he returns to full fitness. For the San Marino Grand Prix, the Movistar Yamaha MotoGP Team will set up his garage as usual, so his two YZR-M1s will be there for the fans to see. This weekend the Movistar Yamaha MotoGP bikes will again sport a "#rodamosjuntos" logo, as part of a safe driving awareness initiative started by Movistar. The safety campaign was launched during La Vuelta (and run until September 9th) to promote mutual respect between drivers and cyclists on the road. Besides supporting this safety initiative, the Factory Yamaha team is also supporting KiSS Misano (KiSS stands for Keep it Shiny & Sunstainable). On Thursday, September 7th, Yamaha Motor Racing Srl General Manager Marco Riva will attend a pre-event press conference, where he will reveal the special Yamaha Tricity that Yamaha Motor Italy is donating to the Misano Circuit to support the environmental and social sustainability programme. The special livery Tricity is to be used for health emergencies. The vehicle is styled to match KiSS Misano's "green image", so it will stand out in a crowd, and it comes equipped with a Cardiac Science AED device (a resuscitator). The Misano track was constructed in 1972 and was a regular scene for Italian Grands Prix throughout the 80s and early 90s. The 4.2 km track is ridden clockwise since a radical renovation was done to meet MotoGP's safety regulations in 2007, putting the circuit back on the calendar. The upgrade also included a new chicane, giving the 4.2 km track its current lay-out of six left and ten right corners. These improvements not only made the track safer, but also increased the race excitement, as the numerous fast corners provide many overtaking possibilities for the passionate Italian fans to enjoy. "Unfortunately we will arrive at the Misano Grand Prix without my teammate Valentino and it's a big shame. I know it's a very special GP for him, as it's his home race, and it will not be the same if he's not there. I wish him a quick recovery and hope to have him back in the garage as soon as possible. We are very motivated after the podium at Silverstone, we're working in the right direction again. I'm starting to have the same feeling on my M1 that I had at the beginning of the season and that gives me a lot of calm and allows me to focus on continuing to get points in each race. It's very positive that we were able to give a good performance in the test at the Misano track some weeks ago and we improved a lot of things on the set-up, so I will try as always to give my 100% to bring a new victory to Yamaha." "It's a big pity that I can't be at my home GP. For sure, I was really looking forward to the round in Misano, because riding in front of the fans there is something very special, but I have to treat the injury with care. I know the team is supporting me during the rehabilitation process. Fortunately I'm fine, I'm not too bad and I've already managed to start some light physiotherapy. The recovery time isn't short, but I will do everything I can to get back on track as soon as possible. I have to say thanks to everyone for the affection you have shown me during these days. See you soon!" "After the test in Misano, almost three weeks ago, we had a really good race weekend at the Silverstone Circuit. Maverick is confident and he's 100% focused, as always, on getting as many points as possible in this weekend's race. As the championship standings are bunched up again, we're really looking forward to this next round. The whole team loves Misano, not only because the track is amazing, but the atmosphere there is something special and the San Marino Grand Prix is also a second "home race" for the team. However, Vale's accident has cast a bit of a grey cloud over the event. Our team will miss Valentino. We wish him all the best and look forward to having him back as soon as possible." The upbeat Monster Yamaha Tech3 rookie duo are fired up for the San Marino Grand Prix this weekend where they fully intend to fight for two notable results aboard their Yamaha YZR-M1 MotoGP bikes. Johann Zarco has his sights set on concluding the 28 lap battle inside the top five at the thirteenth round of the championship. Whereas Jonas Folger determinedly aims to bounce back from a recent run of bad luck and duel for the top independent rider honours on the beautiful Adriatic coast. "I am excited to visit Misano because it's an interesting circuit and after visiting Austria and Silverstone, it will be a small track for the MotoGP bikes. It is going to be very important to work effectively with the team in order to set the bike up and feel comfortable so that we can have a positive race on Sunday. For sure the GP weekend will not be easy, but I hope to be consistent from the beginning to the end. The circuit is one that I like and I have good memories from my days in Moto2 and the 125cc class. In addition, the weather can be quite hot and the venue is right next to the Adriatic Sea. So overall, I aim to have a rewarding time and finish inside the top five to get a lot of points for the championship." "Of course I am looking forward to this weekend after the tough time that we had at Silverstone but I am sure that we are going to have more luck in Italy. I have great memories at Misano, including a pole position in Moto3 and some good results in the past. It's a track that I really like a lot and perhaps we will try the new aerodynamic parts again because I think we will have an advantage with the winglets at Misano. I am sure that we will have a better time than the last three races and I hope to finish the weekend with a lot of points." 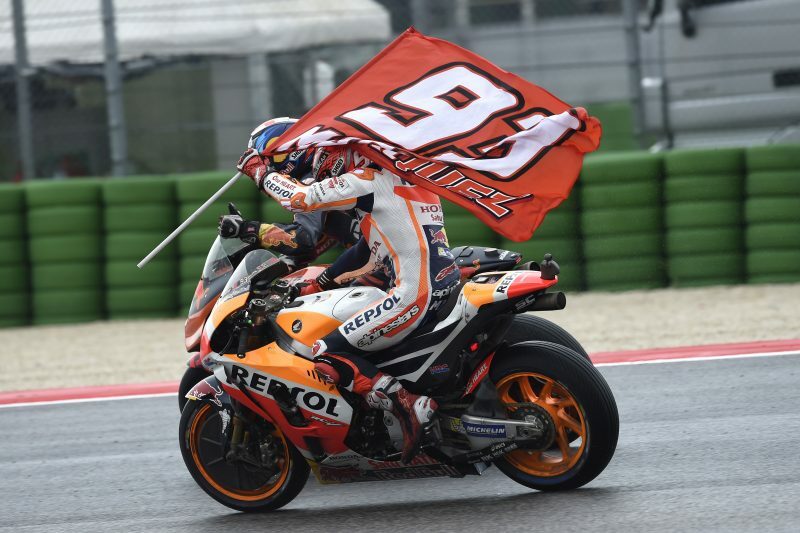 "Misano is the next event for the MotoGP World Championship and it's always a very exciting weekend with many fans, hot weather, and a fantastic atmosphere. In addition, it's a really special circuit and different to the last tracks that we have visited because it's short as well as anti clockwise and a place where some riders don't always have a good feeling. Clearly, the factory teams have been testing there, but few independent teams have and certainly not Tech3 but we are ready and excited. Aside from that, the big news is that the national hero, Valentino Rossi will not be on the starting grid due to a very unfortunate off road accident. The atmosphere won't the same without Valentino, but he is out of the hospital and we hope that he will be able to visit the track for the fans who will support him and aid his recovery process. For Monster Yamaha Tech3, it is going to be another tough race for sure as the level is so high. We have to try to be in the top five but we also have to remember that both of our riders are rookies. Most importantly, it's vital that our guys perform well so they fight for the Rookie Of The Year title which is highly significant for Johann and Jonas. Currently, we also hold the top independent position and this was not easy or planned when you consider how fast the other riders are, but we are leading this. Therefore, we aim to continue scoring some good points so that we can carry on fighting for this. Italy is a special country for MotoGP racing and we can't wait to be back on the track. Johann was our only rider in Silverstone on Sunday and he had a great race. Whereas Jonas was unfortunately not able to participate, but he is 100% physically fit so we hope to be able to produce an entertaining show and finish this Italian week on a positive note." Team Suzuki Press Office – September 6. It is the 13th race of the season and Team SUZUKI ECSTAR return to Italy for the Grand Prix of Misano and the Rimini Riviera. The lovely and warm location on the seaside will greet Andrea Iannone and Alex Rins for the penultimate round before their departure overseas. Alex Rins is arriving to the Italian Riviera in positive mood after the fine performance he had in Silverstone. Not only was he able to have a positive race with solid, fast pace, but his improvements throughout the whole weekend have been consistent. His capacity to learn very quickly and adapt to the MotoGP class is remarkable. For Andrea Iannone this will be a sort of “home grand prix.” His hometown Vasto is only a couple of hours away from the Marco Simoncelli Misano World Circuit. The improvements made to the setup after the Brno test are paying off, and although the results of last race were below expectations, the progress made give high hopes to the Italian for a positive race in Italy. The circuit is still 4.2km (2.63 miles) long, with six left-hand corners and 10 right-hand, with the longest straight being 565m (1853.67 ft) in length. The surface itself is fairly flat, without elevation changes, allowing fans to get the best view of the track action. In fact, the track is well-known for having a great atmosphere. Close to the city of Rimini, the Misano Adriatico circuit was constructed in 1972 and has since undergone an array of modifications. A fixture of the Italian Grand Prixs throughout the 80´s and early 90´s, Misano returned to the MotoGP calendar in 2007. The 2017 MotoGP season moves into its final third with the Gran Premio di San Marino e della Riviera di Rimini this weekend, and never before has the title chase been so tight, with the top five riders in the MotoGP Championship covered by only 35 points after 12 races. 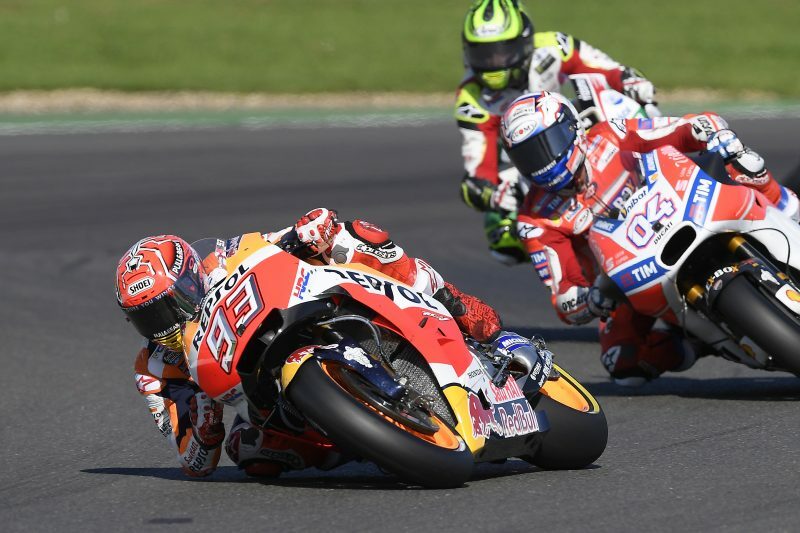 Repsol Honda’s Marc Marquez and Dani Pedrosa are among them, Marc in second place, nine points behind leader Andrea Dovizioso, with Dani in fifth. 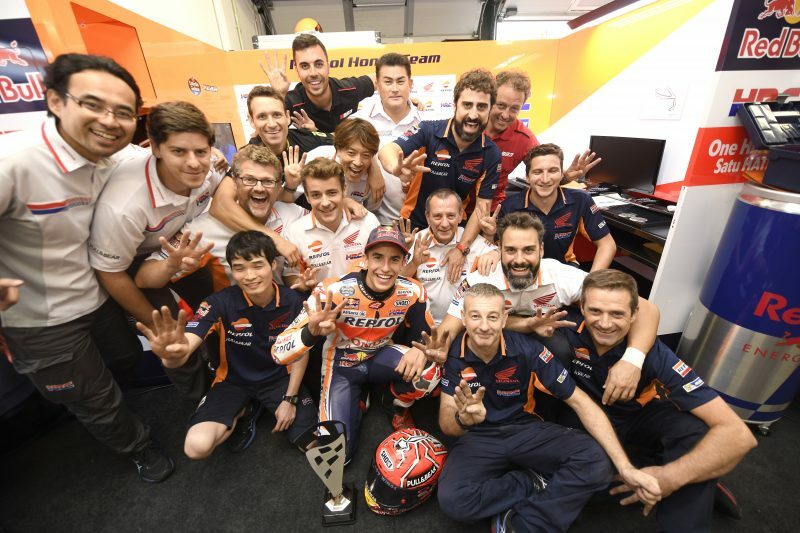 After a tough race at Silverstone, Marc and Dani look forward to again fighting at the front this Sunday at Misano World Circuit Marco Simoncelli, a track where they both have great records and where, on 20 August, they spent their fifth and final allotted day of private testing for the year. 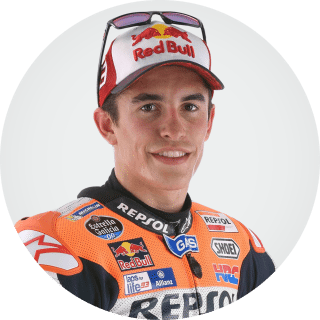 Marc Marquez has 4 wins, 1×125 (2010), 2xMoto2 (2011, 2012), and 1xMotoGP (2015), plus 1 podium and 3 pole positions. 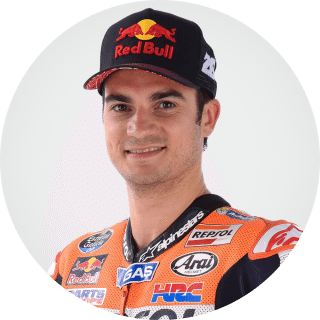 Dani Pedrosa has 2 wins in MotoGP (2010, 2016), plus an additional 4 podiums and 2 pole positions. We’ll try and have a great weekend in Misano, putting the last race behind us. The important thing is that lately we’ve been competitive at all kinds of tracks, so now we go to Misano, which has a twisty, tight layout, with the same approach and mentality that have worked very well for us so far. We’ll look to be as strong as possible, not with victory as the only target but ready to fight for it if we have the opportunity to do so. We’ll work to get the best result possible. We had a positive test there in August, so we’ll go there ready to start well beginning on Friday morning. I’m looking forward to the Misano race and it's a track I like. There are always a lot of fans there, and an incredible atmosphere. I have good memories there and I've enjoyed some strong results, so I hope to be able to work well in every session. A couple of weeks ago we had a test there that went quite well, and hopefully that will help us to get things going in the right direction right from the beginning of the weekend. It was an outstanding Friday for Octo Pramac Racing as Danilo Petrucci dominated the FP2 by finishing in first position the first day of free practice for the “Grand Prix of Misano e della Riviera di Rimini”. Some more difficulties for Scott who couldn’t fight for the Top 10 finishing in 16° position. Petrux was very fast since the morning ending FP1 in 5° position (44 thousands of a second from the hypothetical front row). 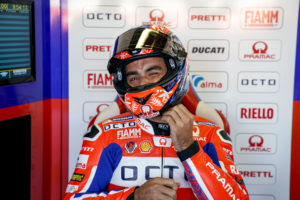 The Italian rider, despite a little flu, came back on track in the afternoon with a stunning feeling, and already from the initial laps he maintained the same pace of Marquez. In the last run, Petrux completed a masterpiece with the best time in T1 and T3 and the first position in Friday’s combined classification. Despite the good indication from the mid-July test, Scott Redding was not able to be competitive, and after finishing in P18 the free practice of the morning, he had to settle for P16 position in FP2. "It was a good day. I wanted to start strongly after the difficulties of Silverstone's free practices. After the test in July I knew I had a good bike even though the weather conditions and the tires were different. I am very happy about how we started the weekend. Is going to be fundamental to start in a forward position here in Misano". "The feeling is not yet the best. I am struggling with the tires. The feeling is that the medium tire is too soft and I couldn’t find grip with the hard tire. After the good feeling at Silverstone, today things did not go well. We have to work on the details, and find the areas where we can improve tomorrow". Team Suzuki Press Office – September 8. Team SUZUKI ECSTAR’s rider Andrea Iannone classified 9th after today’s free practice sessions at the San Marino GP, with a best time of 1’33.740. Teammate Alex Rins had a best lap of 1’35.052, which sets him at the bottom of the provisional sheet. In the morning both riders worked hard to find the ideal base settings as quickly as possible, without having a reference for the track this year. The progression through the sessions went smoothly, with solid improvements for both. The Free Practice 1 ended with Iannone in 16th place (1'35.306 +1.750) and Rins in 17th (1'35.415 +1.859). In FP2, riders were able to benefit from setting improvements, although the team is still working on finalising the feeling with braking and corner entry. Despite this, Iannone was able to put in a strong lap that gave him 9th place in the provisional classification, which may prove fortunate in case tomorrow morning will be rainy. 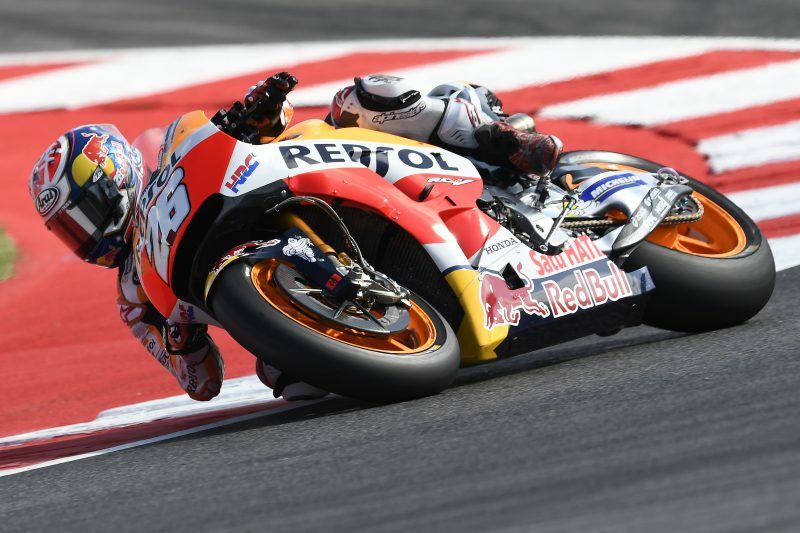 On the opening day of the Gran Premio di San Marino e della Riviera di Rimini, Dani Pedrosa set the fourth-quickest lap, just 0.115” down on the top time, improving on his best effort from FP1 (which had put him in P7) by over a second. Marc Marquez was fastest in the morning and was lapping at the front in the afternoon session as well, but was unable to try a final time attack after suffering a small crash at turn 16 around eight minutes from the end. Marc finished in a very close fifth position, less than two and a half hundredths of a second off provisional pole-setter Danilo Petrucci. Petrux fights in Q2 and conquers a precious P8 at #SanMarinoGP. Seventh row start for Scott. 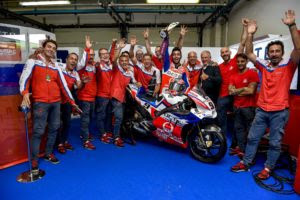 A good Saturday for Danilo Petrucci, who gives Octo Pramac Racing the third row in the “Gran Premio of San Marino e della Riviera di Rimini”. Scott can't find the right feeling in Q1 and ends in 19th position. After dominating Friday's free practice, Petrux shows that he is also in confidence on the qualifying Saturday of his "Home GP". After having encountered some difficulties in the Fp3, also due to a strong wind, the rider from Terni found a good feeling in the Fp4. 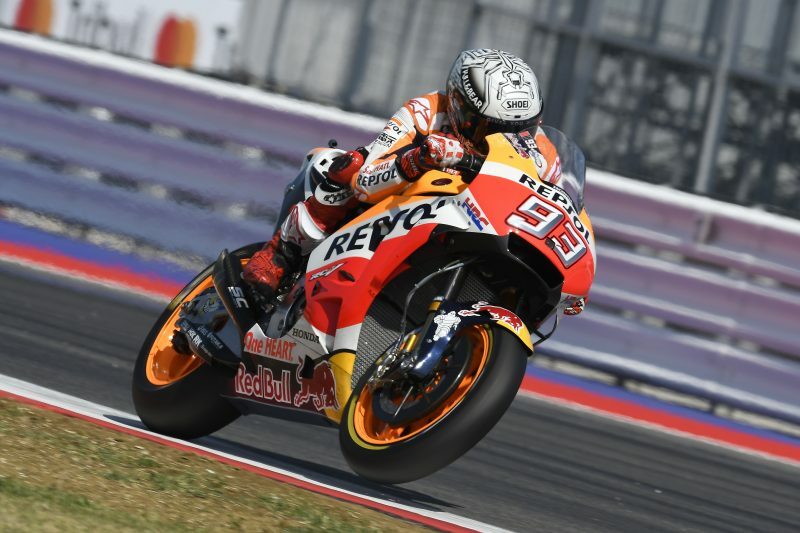 In Q2, he fought until the last lap for the second row and then finished in eighth position, 5 thousandths of a second behind Pedrosa and 3 tenths of a tenth from the front row. After Friday's difficulties, Scott was not able to be competitive during the Q1 and had to settle for the seventh row with a time of 1'34.132. "I was expecting something more. Yesterday, I was not really at the maximum with the bike but I managed to be fast. This morning the wind gave us some troubles, and I was not able to find a good pace. A good result would have been the second row but I did not make a perfect lap. However, there are the conditions in order to make a good race". "I am very disappointed for the result of the qualifying, but if I have to be honest I struggled all week end. The feeling with the front was never good and I could not find the right confidence. I was not expecting much from the qualifying, a good result was not easy to obtain. However, there was the opportunity to do something more. The rain? Will see what will happen". Qualifying day at the San Marino GP and the Rimini Riviera saw Alex Rins and Andrea Iannone struggling to get the right feel with their bikes in Q1, the Spaniard ending in 20th place (1’34.138) and the Italian in 21st (1’34.148). In the morning session, Rins was able to improve from yesterday´s lap time, but not enough to get better than 18th position. His struggle with more efficient riding continued in the Q1, with low confidence with the front end. More struggles for Andrea Iannone: he couldn’t improve his time in FP3, costing him his chance to get direct access in Q2. The team delivered a new chassis, in order to be more rigid, which proved to be effective for some points but not a complete solution. In Q1 his bad feeling with the front end prevented him from setting a better time, and ended in 21st place. Team Suzuki Press Office – September 10. 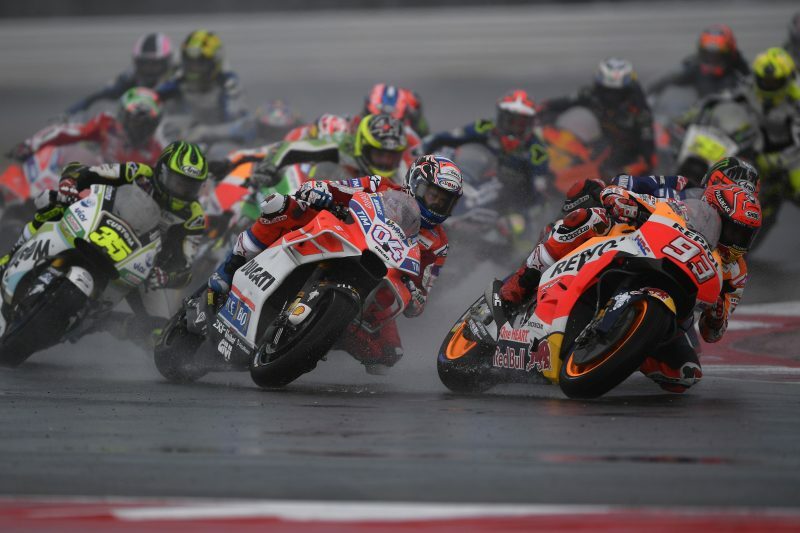 The rain arrived in Misano Adriatico at the beginning of race day, making a mess of the whole situation. The wet conditions rewarded an effective and mature Alex Rins, who took 8th place. This is also his best result of the season so far. Andrea Iannone suffered a problem with his arm which forced him to retire before the end of the race. Starting from 20th place, Alex Rins did not have a perfect jump at the start. He found himself in last place after the first corner. However, the excellent pace he set from lap 2 on was as fast as the riders at the head of the race. This allowed him to advance many positions. The wise management of the race in the second half was crucial to make his way into ninth place and then go for the eighth in the very last corners. Despite a positive warm up, where he was feeling good with the GSX-RR in wet, the race proved to be a hard one for Iannone. Immediately after the early laps he started to have problems with an arm pump that made his forearms too stiff to maintain mobility. In these conditions he was not able to safely ride his machine and decided to retire before the end of the race. Once again on the podium, for the third time this season, the second in Italy after Mugello. 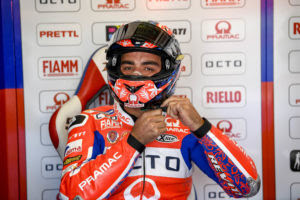 Petrux was fantastic and has brought to Octo Pramac Racing an extraordinary Sunday. Scott gave extra enthusiasm at the team party with a good seventh place. Over Misano the rain was constant through all morning, and Petrux started pushing already from the first lap gaining 4 positions. After overtaking Crutchlow and Vinales he was fourth in the second lap. 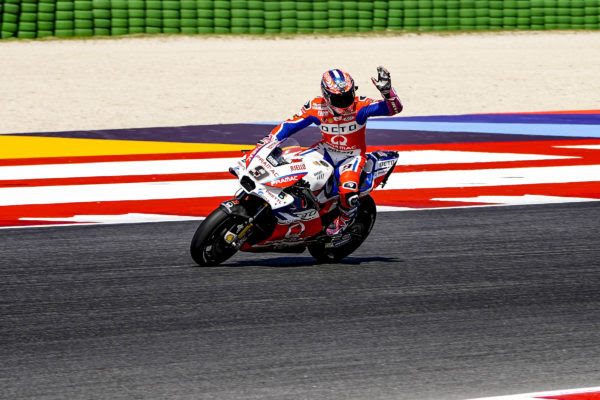 At the fifth lap he was the fastest and he was able to overtake Dovizioso. The fantastic overtake on Marquez came the lap after. Then Lorenzo crashed, and Danilo became the leader of the race in the 6th lap. The Italian rider was the leader until the last lap but Marquez managed to overtake him at the end of the straight. Danilo finished in second position after a fantastic #SanMarinoGP. Thank you Petrux! Scott started in 19th position but since the first lap the pace was good. The English rider had the strength to remain focused and in the 12th lap he overtook Espargaro for the 9th position. Ten laps from the end he tried to catch Zarco who had a technical problem on the last lap. A precious P7 finish for Redding. "It was a fantastic race. From the first lap the feeling was good. I was leading for long until I saw Marquez coming back. I was thinking to make him pass but my fear was that he could run away. Marquez has done a fantastic last lap and he deserved the victory. I would have liked to win the race but I am very happy for how the weekend has gone, and I have to thank the whole team". "It was a difficult weekend. I never had feeling throughout all free practice and qualifying. All things considered I am very satisfied for this result. I was able to have a good race pace, without making any mistake. This very good result will give me trust for Aragon. I have to thank the team for the work that the team has done this weekend". 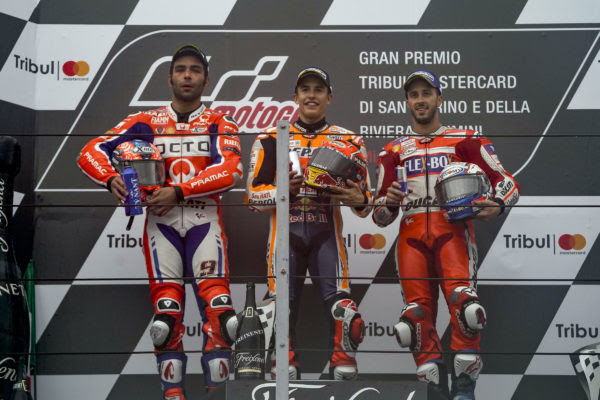 Under today's gloomy skies, at a soaked Misano World Circuit Marco Simoncelli, the air was filled with tension as Maverick Viñales made his appearance on the starting grid for the Tribul Mastercard GP S.Marino e Riviera di Rimini. However, the sole Movistar Yamaha MotoGP rider remained calm and collected, securing fourth place in a very slippery race. With his teammate Valentino Rossi unable to compete in his home Grand Prix due to injury, Viñales had to fly the Movistar Yamaha flag alone, and all eyes were on him as he started from pole. After a good launch off the line, he entered the first corner with caution, slotting into fourth place. He took a couple of laps to get heat into his tyres, after a small wobble on lap 2 gave him a warning of just how tricky the wet track conditions were. Danilo Petrucci passed the Yamaha rider at the start of lap 3, but the Spaniard had a plan. Viñales gradually upped his pace in each sector, trying to determine the limit whilst having to contend with a lack of rear grip in most of the left corners. He set consecutive personal best laps, but he had to keep an eye on his pursuers at the same time. He got into a fight with Cal Crutchlow and Jack Miller, which lost him some valuable time, but the battle was short-lived. Crutchlow was soon caught out by the treacherous conditions of the race, allowing the number 25 rider to seize the opportunity. Back in fourth position on lap 7, as Jorge Lorenzo crashed out of the lead, the 22-year-old could pick up where he left off and started to better his rhythm again. 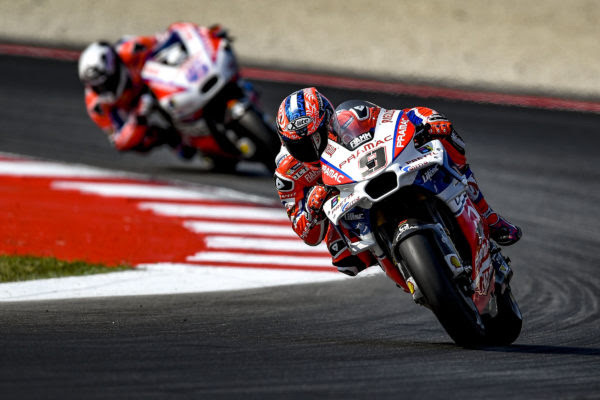 He steadily broke away from Michele Pirro and Miller, opening an over 2-second gap. Viñales had a lonely ride in the final stages of the race, though he didn't stop pushing for even a second. He ultimately took the chequered flag in fourth place, 16.559s from first. Today's results keep Viñales in third place in the championship standings, 16 points behind the joint leaders and 26 points ahead of Rossi, who holds on to fourth place in the standings. The Movistar Yamaha MotoGP Team is in second place in the Team Championship, with a nine-point margin to first. Yamaha is also in second place in the Constructor Championship with a five-point gap to the top of the rankings. The MotoGP paddock will next head to the MotorLand Aragón for round 14, the Gran Premio Movistar de Aragón, held from September 22nd - 24th. "I'm happy with the result, because it is the best we could do. Honestly, today we asked 100% of the bike. I tried to get the best result and today that was fourth. We have to continue to work in the same way, because today was a good improvement compared to the wet race at the Sachsenring, especially the handling of the bike. We still need a lot of grip on the traction, so we have to keep going. I'll have to push in Aragón and believe we can close the 16-point gap to our rivals. On the dry we were really fast, I'm happy we made another step here in Misano. I hope we can do the same in Aragón." "Today's race was really difficult. We only had this morning's 20-minute warm up to prepare a wet set-up and it was clear that the track conditions were going to be very tricky. Maverick stuck to his original plan of riding at his own pace and he did a good job holding off his rivals, which is especially challenging when the track conditions are changing throughout the race. Moreover, Maverick had to manage his race pace whilst suffering from a lack of rear grip in most of the left corners. Nevertheless, he didn't get lured into making mistakes and secured some very valuable points for the championship. We now look forward to the next Grand Prix in Aragón, in two weeks' time, which is a very special event for the team, as we share the title sponsor." Monster Yamaha Tech3 team rider Jonas Folger produced a tireless effort to claim 9th in the highly challenging San Marino GP. The young German began the soaking wet race from 16th on the grid and undertook a decent start to move up two places by the close of the first lap. He maintained his consistency in the tricky conditions before finishing the grueling GP inside the top ten, marking a positive close to the weekend. Meanwhile, Johann Zarco suffered bad luck on the final lap of the race but showed great determination as he wheeled his Yamaha across the finish line after running out of fuel. The rapid French rider began from 6th and ran a formidable pace throughout the sprint, as he held 7th whilst heading into the last lap. The issue then struck but Zarco memorably pushed his bike down the start finish straight to clinch 15th. "I am not so happy about this weekend overall, but I did my best. Qualifying was a different story compared to today because I felt good in the dry conditions. In the wet warm up, we decided to change something but we were a little bit unlucky because by the end of the race we understand that it was the wrong direction with the setting. I struggled with the rear grip and the turning in the last part of the GP but eventually, I finished 9th, however, this was due to Johann's bike giving up. We didn't have the speed so I am a bit disappointed as I expected more, especially in the wet. Now, we have to look onwards to Aragon." "It was challenging but tough for everyone. In the warm up I saw that I wasn't as strong as I would have liked, but then at the beginning of the Grand Prix, I felt quite good. I was happy to have control and see that the other riders were not much faster than me. I stayed focused and then I saw Crutchlow and Lorenzo crash, who are dangerous for me in the championship. Because they fell, it made me realise how difficult the conditions were for everyone. The race was long but step-by-step it got less wet, although it did not dry and this gave me some confidence but not as much as I expected. I had to stay focused and in the end, I was managing the gap to Redding quite well so I thought that everything was in order for the last lap. However, I had no more fuel from turn 11, which was a shame. I did my best to preserve the fuel until the last corner but then the bike stopped and I had to push it on the home straight and that was long. Some riders overtook me and it's a big pity but I made sure that I got to the end because it's the racing mind. I finished 15th, which equals one championship point but it is better than nothing." 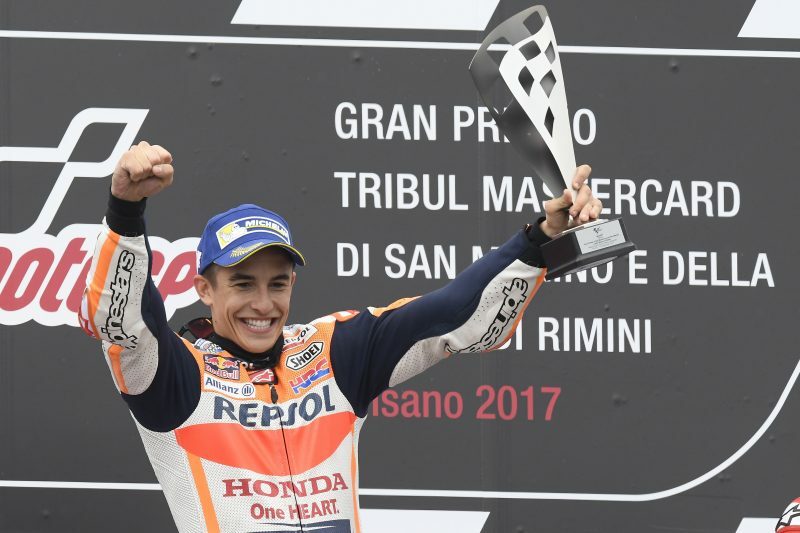 Marc Marquez (Repsol Honda Team RC213V) conquered foul weather and fast rivals at super-slippery Misano this afternoon to take his fourth win of the season and recover lost ground in a thrilling battle for the 2017 MotoGP title. The 24-year-old Spaniard had started from the third on the grid – his sixth front row in succession – on a day when treacherous conditions had caused a record number of crashes in the earlier races. 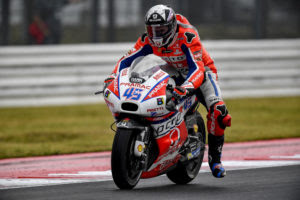 The defending triple MotoGP World Champion seemed to dance with his RC213V as it skipped and slithered through the puddles, then pounced on long-time race leader Danilo Petrucci (Ducati) at the start of the last lap. He held his advantage over the Italian to win by just over one second. 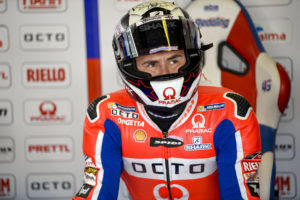 A fortnight earlier Marquez had lost his hard-won championship lead to Andrea Dovizioso (Ducati) with a rare technical issue. Dovizioso finished third today, so the pair are now equal on points, with four wins each, and just five races to go in the closest title fight in racing history. Technically, however, Marquez is ahead, with three second places, while Dovizioso has just one. Marquez has built momentum this season thanks to steady improvements to his machine and some very intelligent riding. Here he was fastest in the first three practice sessions, narrowly missed pole position in qualifying and was fastest again in this morning’s wet warm-up session, during which he had his third tumble of the weekend. 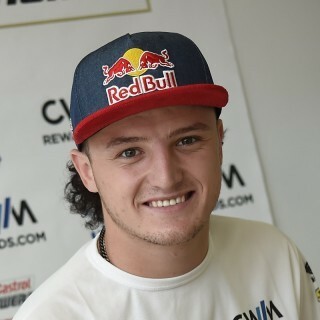 The difficult conditions brought unpredictable results for the other Honda riders, with independent-team rider Jack Miller (Estrella Galicia 0,0 Marc VDS Honda RC213V) best of the rest, taking a sixth-place finish to equal his own top result this season. The Australian has shown he can excel in difficult conditions – last year he claimed a first premier-class win in heavy rain at the Dutch TT. There were two more Hondas in the points, in an afternoon of mixed fortunes for the other riders. 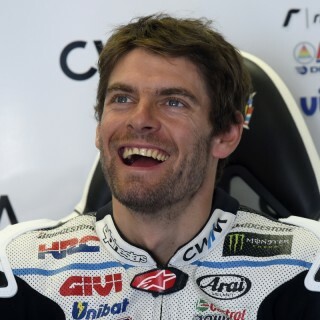 Cal Crutchlow (LCR Honda RC213V) finished 13th, fighting back after falling and remounting in the early stages. He had qualified fourth, and had just moved up to fifth place, before he slid off. Crutchlow rejoined in 21st place and moved steadily forward. As well as coping with a battered bike, the Briton had to overcome pain from a severed tendon in his left-hand index finger, suffered in a kitchen accident last week. It was an even more difficult afternoon for Dani Pedrosa (Repsol Honda Team RC213V). The former 125cc and double 250cc World Champion and multi-MotoGP race winner struggled with the ice-like conditions to finish 14th. Pedrosa won at a sunny Jerez in May and has claimed six more podium finishes so far this season. 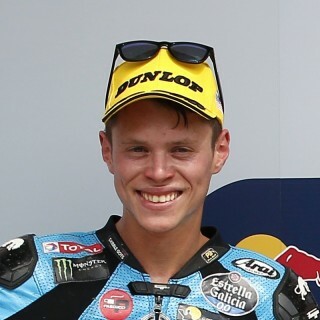 Tito Rabat (Estrella Galicia 0,0 Marc VDS Honda RC213V) was having a good run in the points, lying 13th when he joined the crash list on lap 20. He was one of six riders not to finish the race. The next race is the Aragon GP in a fortnight, after which the GP circus embarks on three gruelling flyaway races on consecutive weekends, in Japan, Australia and Malaysia. “It has been a very difficult race. Unfortunately, I struggled a lot as I could not put any heat into the tyres. For me, it was like I was riding on ice. This morning I crashed during the warm-up and even if we tried everything to solve this issue we could not come out with a solution. I was very slow, risking to crash at every corner. Only at the end, with much less water on the track, was I able to increase a bit the temperature and my lap times immediately dropped by almost four seconds. It was a shame as we’ve lost many points. We can now only keep focusing in the next races and try to achieve better results. Regarding Toni (Bou) I think he deserved this impressive 22nd Trial title, he is an example for everyone!”.